TMC14 (Twitter Math Camp) was an amazing experience for me. Christopher Danielson and I collaborated on a morning session on embodied mathematics, juxtaposing familiar hand-based manipulatives with body-scale math/dance learning. 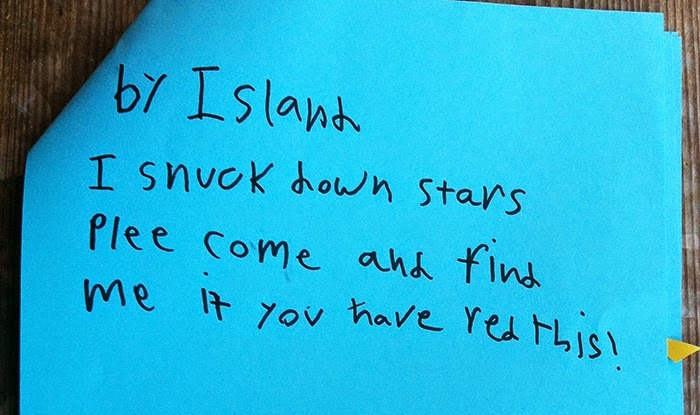 You can read the Storify of our morning activities to get a sense of what we did. In the evening, after dinner, some folks hung out in the back lobby of the hotel which included a little uncarpeted room with an ice machine and the path to the hotel pool. It's also where I decided to put down some blue tape and see what might happen. What happened was that some of the folks from our embodied mathematics morning session taught other folks the math/dance steps they had choreographed earlier in the day. I was incredibly touched to see my math teachers/dance learners start by orienting their new dance partner to the square, showing them the many different ways they could move around that space and THEN teach the dance step. The slide show and the videos below will give you a great idea of some of what went on, but here are the lessons I learned during those two amazing evenings. 1. You don't know what math you can learn while dancing or at body-scale until you actually do it. 2. Even experienced math teachers can have new mathematical challenges and insights at body scale. 3. It's useful and interesting to learn someone else's math/dance step, but even more interesting (and mathematical) to make up your own. 4. Dancing mathematically can lead to all sorts of new questions, but it doesn't always make for a dance that really works. This one was great, but the final version was better. 5. You can have a ton of new math questions while dancing, but sometimes you need to take the time to let your body catch up so whatever you're trying to express in the dance can look the way you want it to. 6. When you make up your own math/dance step you start having new and very mathematical questions. Max wondered if you could make up a 4-beat pattern that would look beautiful when danced in all four quadrants of the coordinate plane. The slideshow below is sequenced to illustrate the progression of people coming to the Blue Tape Lounge to experience and know mathematical patterns within a percussive dance system. THANK YOU to all who participated and observed these two amazing nights' worth of inquiry. Last week I drove 22 hours round trip to be at my first Twitter Math Camp (TMC) for three days. During that time I co-led a morning session with Christopher Danielson (two hours a day over three days) focused on embodied mathematics both at body- and hand-scale. 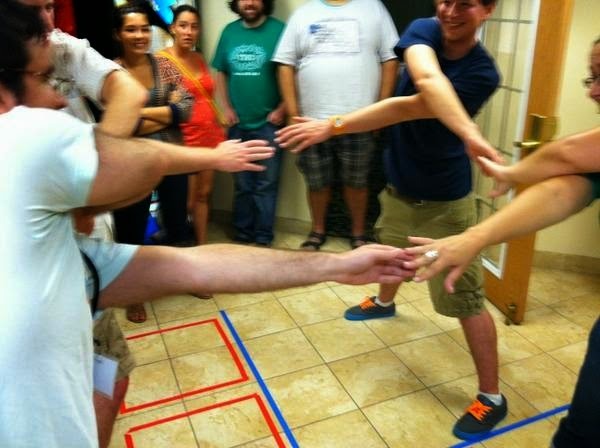 You can read the Storify recap I created to get a sense of some of the things we did. I think it captures the spirit of TMC as a whole -- focused, intense and active with moments of pure hilarity. I also instigated the after hours event known as The Blue Tape Lounge, had some very fruitful investigations into body-scale number lines with Max Ray in some in-between times, and spent countless hours in conversations with a number of fascinating folks over meals, all of whom have been instrumental in my growth over the past year or two on Twitter. Each one of these experiences was interesting, engaging and often profound for me. I will be telling a few more stories over the next week but, to start, it's actually part of someone else's reflection that creates the best overview of what the experience meant to me. "The last thing I did on Saturday was to take place in a body-scale number line exploration led by Max Ray and Malke Rosenfeld. I got to share my insights and experiences with number lines that others may not have had, I got to see it in other people’s eyes, and I experienced new revelations and am excited to dive into them deeply. "This last thing leads me to my final thought. During our work with the number line, Malke constantly pushed back – what are we actually gaining by working with the number line using our bodies, instead of just paper and pen? It pushed us to keep developing new insights and sharing them until one moment I heard Malke make an involuntary gasp – there was a moment of breakthrough, one we never would have had without using our bodies. 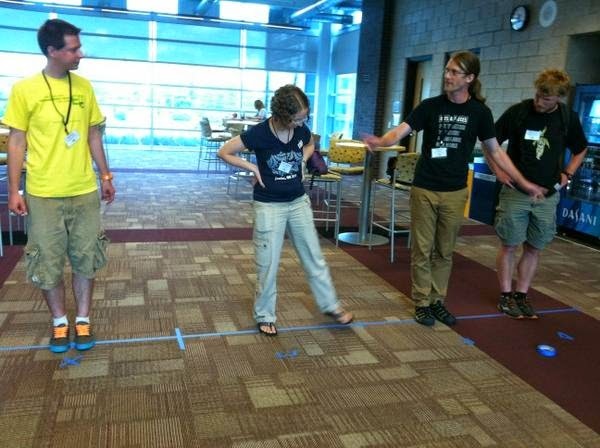 "So you could ask the same question – what do we gain from using our bodies to meet in person at TMC, instead of just writing to each other as we do in the MTBoS? There’s this energy that infuses all of it that you can’t feel remotely, these deep experiences and quiet moments that can’t be done publicly, this sense of connection that makes all the other work we do more powerful." This picture illustrates one of my favorite things of the whole event: getting to watch the reactions of the math people interacting with familiar math ideas in a completely new and novel situation. And that is the subject of my next post: Tales from the Blue Tape Lounge. Talk to you again soon! Today my kid and I were driving to the Indianapolis Zoo. It takes over an hour to get there. Near the end she suggested playing the sign version of the alphabet game and I said, "What if we did a math version?!" [C] Congruent shapes: I found this one and a nice way to introduce that language. [C] Curves: This was hers. She saw curves in the telephone wires. [E] Equal: She used this word in relation to the shapes she saw. I mentioned the word congruent again in relation to this idea. [H] Height: Some trees were higher than others. [I] Interval: The telephone pole were spaced in equal intervals. In this game I don't think it matters if the adult ends up identifying more things than the child. It's engaging for everyone to be looking out the window and a great opportunity for talking math with your kids in a low-pressure, (hopefully) highly enjoyable context. You get the picture, right? Math talk can be about numbers but also about relationships (higher, smaller, faster) and other ways we describe our physical world. Next time it would be fun to look for [A] Arrays, [M] Multiples, [N] Numbers or even the math version of "Are we there yet?" [Z] Zeno's Paradox...you can't get there from here. One of the best things about going out of town to work is coming home to discover some new math treasure my kid has created during my absence. One of my favorites was a couple years ago when she embellished a piece of fabric with a beaded freeze pattern. Here's what I got this morning after returning from a fabulous day-long Math in Your Feet intensive with some amazing educators in Connecticut. 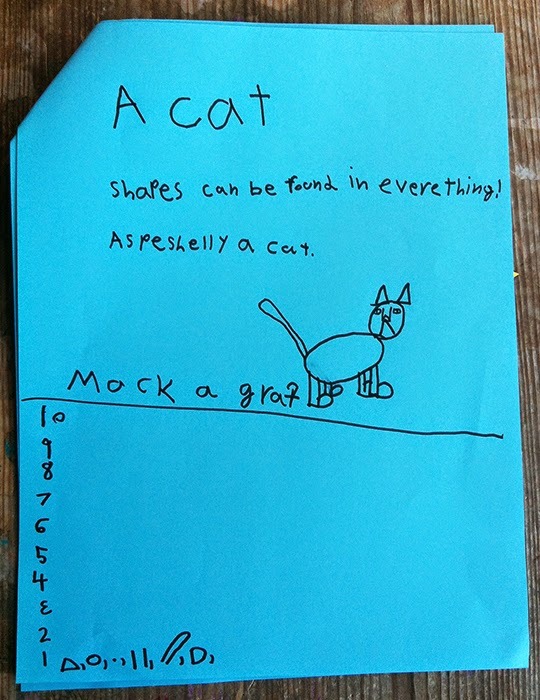 The first page says: "Shapes can be found in everything! Especially a cat. Make a graph." I think I'm supposed to put an X for every shape I see in the cat. 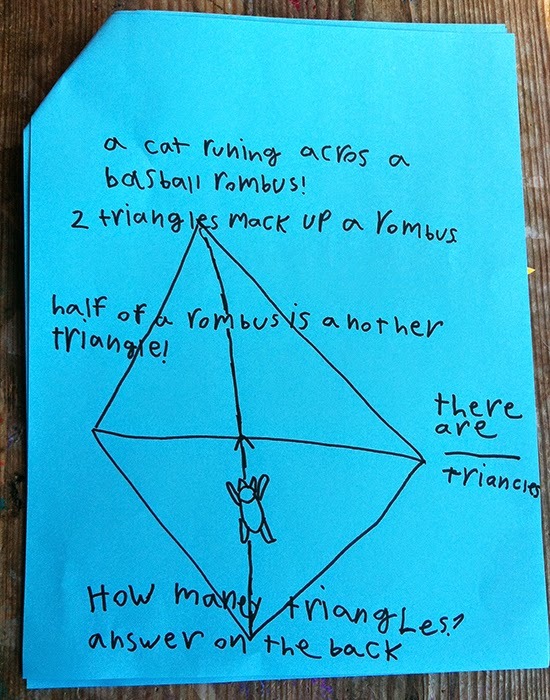 The second page says: "A cat running across a baseball rhombus! [!!!] Half of a rhombus is another triangle! There are ____ triangles. How many triangles. Answer on the back." Apparently she went downstairs (where all *my* math making materials are kept, even though she has plenty of making supplies upstairs) when she wasn't supposed to. But the call of the scissors and glue sticks were just to great, I suppose! I was supposed to discover this on my desk at some point, but she was too excited to wait. What a treasure! 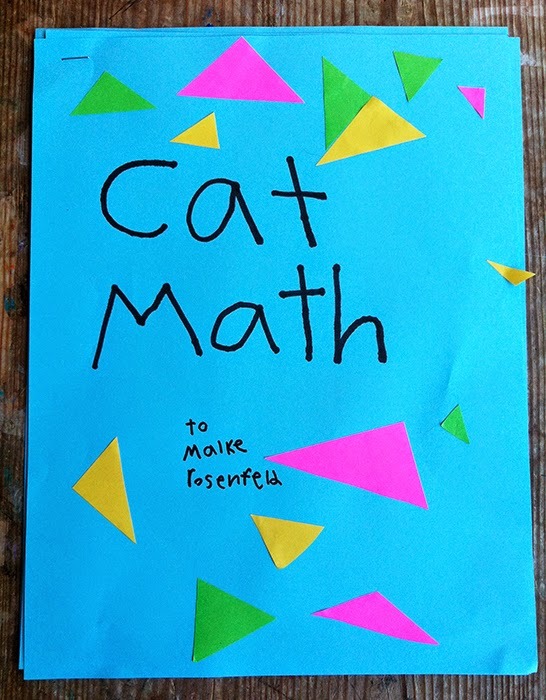 My (newly 9yo) daughter is a sensory girl who likes to mix things and ask questions while doing so. Over the course of her short life she has created all sorts of goopy, colorful, muddy, tasty inside and outside concoctions out of food, paint, mud, sidewalk chalk, bubbles...all the while narrating non-stop about what she's going to do and how and why. 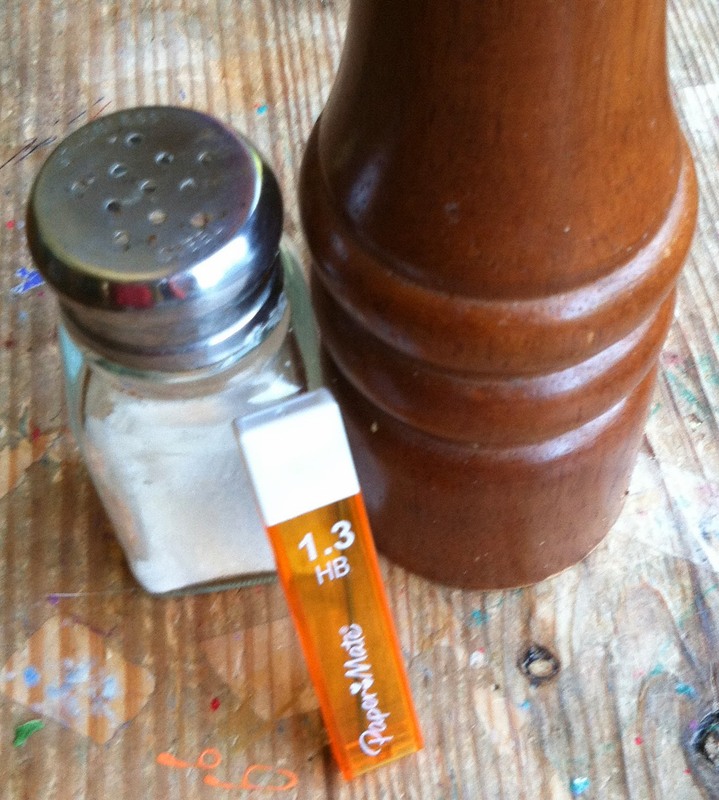 "Can I take salt and pepper and pencil leads and try to magnetize them in water?" "Yes, as long as you clean up after you're done. And make sure to record your findings." Will it work without water? NO. It does not work if both are not in water. It only works if one is rubbed! When it's wet it sticks to me! Will it work when I don't rub it on the magnet? YES, but it does not stick for long. Her ultimate conclusion was that she could "magnetize the pencil leads but they could not stick to other magnets beside themselves" and that "water has something to do with it." I recently picked up a book at our public library used book store called Curious Minds: How a Child Becomes a Scientist. The book is a collection of essays from interesting scientists who were asked to write about how and when in their childhoods they became interested in an idea that led them to go into the sciences. My favorite essay is from Mary Catherine Bateson who is the daughter of Gregory Bateson and Margaret Mead. She talks about how she grew up in a household where "the how" of science was the focus. "The what" her father and mother studied changed over time, but it was her childhood experiences of looking for patterns and asking questions that really brought her into her field. So, when my husband pointed out that the leads stuck together because they were wet, not magnetized as she had concluded, I agreed. We did not succeed in convincing her otherwise, which is just fine with me. What is most important about her sequence of question asking is that she was engaged in THE PROCESS (the how) of science. To me, at this point in her life, the feel for the process is what we want her to have -- the curiosity, the personal agency, the flow of question asking. After all, if you talk to real scientists and mathematicians they will tell you their work is about days and months and years and decades of wrong turns and the resulting new questions. In today's fast paced world it's hard to muster patience for this idea of building understanding over time but the truth is this: Coming to know often means you may not have all the answers you want or need right away but as long as you have new questions to ask you can be sure you are heading in the right direction.